Leikkaan kortit : September Christmas cards! Hei, oikein mukavaa sunnuntaipäivä! Tervetuloa syyskuun Penny Black and More haasteen pariin. Tässä kuussa aloitetaan jo kunnolla joulukorttien teko! Muista käyttää työssäsi leimasinta, voit osallistua kolme kertaa kuukauden aikana, kurkkaa upeat palkinnot blogista! Hello, first Sunday of the month - it's time for new Penny Black and More Challenge. "Get ready for Christmas" - time for seasonal creations - and remember to use stamp! 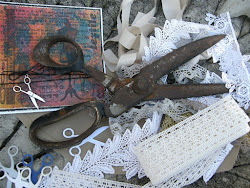 Our sponsors are Penny Black, Swedish House Crafts, Rare Earth Stamps. 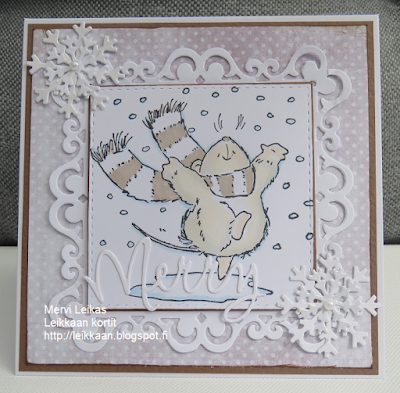 Using Penny Black 1524K Let it Snow! Old favourite stamp, coloured it with ProMarkers. papers are from Penny Black pad "gentle whispers"
What a great array of cards Mervi, I especially like your choice of soft colours on the first. Have a lovely Sunday - and those pears are just about ready for eating. Voi kuinka ihania kaikki ovat. Cute, fun cards. Love this image. Thanks for sharing with us at Winter Wonderland. Beautiful cards and nice work. A lovely set of cards, I thought your card was lovely but then I saw the variations and now my fav is the blue one but only just! Such a beautiful set of cards, all so pretty and lovely colours. Mervi, your cards are precious! So cute and HAPPY! I love the image and your amazing designs. So glad I got to see your critter project showcased at the 2 Crafty Critter Crazies Challenge. Thanks for supporting us, and we hope to see more of your pretty creations in the future. Please check back to see if you are a winner or our next guest designer. Sending you wishes for a wonderful day! Super cute cards Mervi. Loving the image and the frame you used is really pretty! 3 gorgeous cards, love that image and how the cards are similar yet so different! This is so cute love it Thank you for sharing with us over here today at the Classic Open Design Team Challenge and best of luck with your entry. Upeita kortteja kaikki, hieno puhtaan lumen ja pakkasen tuntu! Adorable! Love how the background cardstock changes the look and feel of your cards. Thank you for sharing with us over here at Classic Design Team Open Challenge and best of luck with your entry. This is such a joyful stamp, your cards are lovely. Thank you for joining us at 2CraftyCrtters. Cute set of cards...the colours are so nice and soothing..